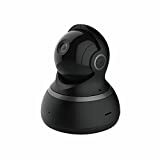 The YI Dome Camera is one of the most popular home security cameras on Amazon for a few different reasons. The fact that it streams crystal-clear video in 1080p Full HD resolution is definitely one of them, and all the nifty features in the app is another. But one of the best things has to be the fact that you can remotely pan and tilt the camera using the iPhone or Android app, allowing you to change the video from anywhere in the world. Also cool is the activity tracking feature, which makes the camera automatically pan around to follow any motion that’s detected while it’s in away mode How cool is that! ?